Urban Sketchers Seattle: House on Queen Anne Hill. House on Queen Anne Hill. Hey folks! I find self-promotion so distasteful that I haven't mentioned my book in months, but I'm down to my last carton so if anybody wants a copy of Now Where Was I?, now's the time. I shipped two copies to Germany and one to Malaysia this morning. The response to my little experiment in self-publishing was gratifying and rewarding. By sharing none of the profits with Amazon or any publisher, distributor, etc, I was able to put all the money into the highest quality production my Kickstarter funds would allow and I'm proud of the book. Reviews were terrific. I'm deep into the next project, but haven't been posting here because the drawings don't fit the USk guidelines (I'm working on a graphic-novel memoir). So if you'd like a copy of Now Where Was I?, go to ETSY and search for it by title or author. 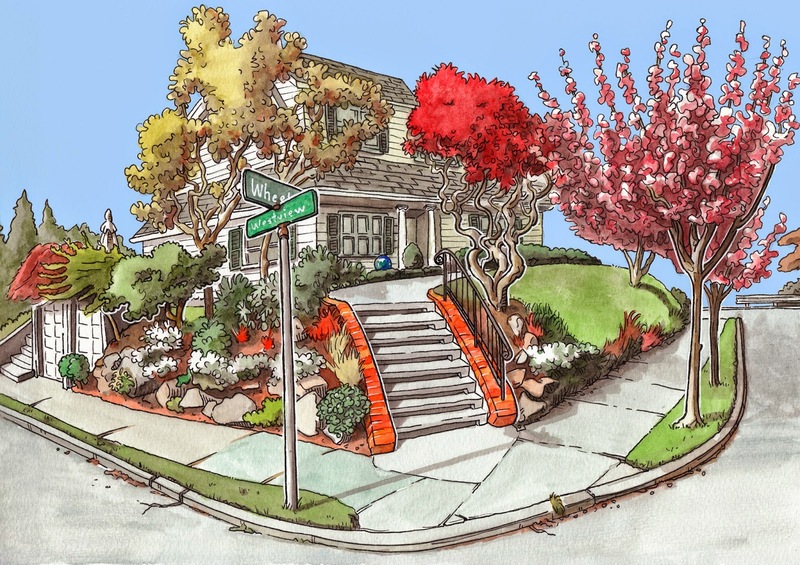 Here is a commissioned drawing of a house here in Seattle. That is by far one of the best sketches I've seen on the blogs this year so far. Good go. Wow, Maureen. Thanks kindly. I love doing these commissioned pieces for people who want an original drawing of their homes. I'm doing two more this week in Snohomish County. I'll post them as soon as I do.